I returned once again to Galleria Supermarket today in search of mocha bread. RS highly recommended this item from Korean bakeries. Since it's that time of the week for me to stock up on bread, I purchase a loaf of mocha bread from Bakery Gateaux. This oval loaf is entirely covered with a crunchy sugar/butter shell that is reminiscent of the "Mexican Bun" one can find in Chinese bakeries. The bread itself is soft yet a little elastic-y from a healthy dose of gluten so it is not as delicate as the chestnut bread. However, the most enticing part about this bread is the light mocha colour of the crumb. The coffee taste is not very pronounced but the occasional pieces of walnut in the bread contributed great textural interest. The mocha bread is delicious for snacking or breakfast. While I was waiting to pay for my purchase at the bakery counter, I spotted other customers picking up their order. Bakery Gateaux also sells specialty coffee and other drinks. However, what really stirred my interest was the colourful bowls of shaved ice. It is exactly what I always imagine a bowl of shaved ice should look like...the kind that I used to draw when I was a kid. Of course I ordered one for myself without further hesitation. At the bottom of the bowl is a huge mound of ice flakes, so delicate and addictively crunchy. On top of the ice, there were balls of bright red watermelon, fruit cocktail, sweet adzuki bean paste, Korean gummy jelly cubes, cornflakes, a scoop of vanilla ice-cream, and drizzle of chocolate syrup. Each bite was a combination of varying texture. Although it was a little pricey at $5 a bowl, it was a wonderful summer treat. It's always a joy to try food that I never had before. When I visited Galleria Supermarket on Monday, I picked up a few things from the in-store bakery. Although I'm quite familiar with the asian twist on bakery items such as the soft spongy enriched bread dough and buns fill with all kinds of delicacies imagineable, I was surprised to find some uniquely Korean variation. First off, I had a loaf of chestnut bread. This bread is very soft and has a lovely cream-colour crumb. The loaf is topped was a streusel topping. However, the star of the show belongs to the generous amount of chopped chestnut that stud each slice of bread. The chestnuts were slightly sweet, tender yet substantial compared to the airy dough. This bread was additive. I also bought something called mamoth bread. It was a sandwich of two oval flatbreads topped with the same streusel topping with apricot jam. It tastes like what you would imagine from the description. My last and most interesting purchase was a black sesame sticky rice puff. This is definitely something totally out of the ordinary for me. Close your eyes and picture the following...you have this golden fist-size ball that looks like a giant cream puff (pate de choux). You tear the puff apart with considerable effort because despite the crunchy flaky exterior, the inside of the puff is elastic like a mochi. The dough is fragrant with slight sweetness from the glutinous rice flour and black sesame. The inside of the puff is hollow. Each bite was a combination of flaky, crunchy, and chewy. This puff is like the love child between a choux pate and jin dui. There's something about a fish-shaped snack that always mesmerizes me. Is it because the fish is smiling, totally oblivious to the fact that I'm about to bite its tail off? Of all the fish-shaped snacks around (and you know there are lots), my favourite has got to be taiyaki, or bungeoppang as they are known in Korea. Taiyaki is a palm-size pastry made with batter grilled to perfection and filled with sweetened adzuki bean paste (aka an). The batter is similar to what is used to make waffles but there's definitely a distinctive taste to it that's unfamiliar to western pastries. In Toronto, my favourite taiyaki vendor is the Cafe Green Tea located in J-Town. The cakey exterior is full of the wonderful aroma of eggs and the filling is a generous portion of lightly sweetened an. Sometimes, if you're lucky, you can even buy green tea (aka matcha) flavour taiyaki too. Yesterday, I went shopping at Galleria Supermarket after work, one of the largest Korean grocer in Toronto. Just outside the entrace, a little red and yellow street stall glowed with warmth and the delicious smell of grilled batter washed over me like a wave. What do you know, a street stall selling bungeoppang! These bungeoppangs are slighly smaller than the ones at Cafe Green Tea but the crispy and smokey thin shell is what really makes them special. 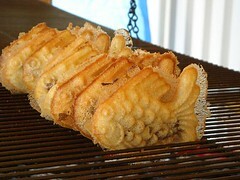 It is lighter than what I would expect from a taiyaki and yet the little crunch from each bite is so addictive. At $2 for 3 or $5 for 8, these bungeoppang are an affordable snack. I had more than my usual share of road trips in the past few months thanks to out of town competitions from inline skating and dragonboating. What it means is that I ended up eating at service stations way more than I would like to. In Ontario and Quebec, most service stations are dominated by Tim Hortons, Wendy's, KFC, and McDonald's. It amounts to quite a limited choice of food really. Before a race, I would typically order a chunky chicken wrap sandwich from Tim Hortons because it was the only non-fried and non-greasy meal option available if I want to avoid the horrible sandwich buns. Coffees from Tim's are tempting but in a long road trip, I would avoid caffeine to lower the number of washroom breaks. If we drive back immediately after a race, the food situation becomes less manageable. I would be starving and the smell of greasy fast food would actually be enticing (oh the horror). Take today for example. After our regatta in Montreal, we did not have time to eat anything before hopping on the bus. As soon as we reached our first service station, my growling stomach told me that I wanted a burger and a baked potato from Wendy's. It took much self-control before I convinced myself to have a chicken BLT salad instead. I know full well that calories-wise, the salad is about equivalent to the burger and potato. However, munching down on vegetable and lean protein (that's the chicken, not the bacon) seemed to be a better idea than mystery meat in a burger patty. There will still be a few road trips ahead before the season wraps up. I think I should start looking into packing delicious and nutritious food for trips so I can avoid the temptation and dilemma of fast food at service station. Over the years, among the various activities that I engage in, there's usually a coach/teacher/authority figure that makes me feel very self conscious about my own (in)ability. In high school, I dread playing solo on the piano with Mr. M looking over my shoulders. I could be playing a piece of music that I practiced a million times and played well in front of an auditorium full of people. But as soon as he was standing beside me, every little mistake seemed to magnify and I would get so flustered that nothing seemed to go right. Since graduation, I've been working in a software company with a team of brilliant developers. Every one of my team members is smarter and more experienced than me but I'm not at all uncomfortable as the most junior member of the team. Whether it is true or not, I feel that I contribute to the team and I'm never hesitant to offer my humble or sometimes misguided opinion on any technical problem. However, until very recently, I was afraid to show my work to a coworker in my company. Although he never said it, I always got the impression that my code is not fast enough, I do not meet my deadline quickly enough, and I do not work smart enough. Logically, I know that this is probably a result of my skewered perception. However, it didn't stop me from feeling sheepish about my work in front of him. Since I started training with TISC, this irrational drop in confidence has manifest itself again whenever I interact with coach ARA. I don't understand the reason at all. In any other situation and with any other skater including coach EG, I'm absolutely comfortable with the fact that I'm making very slow improvement in my skating. I accept that I'm not very athletically-gifted so it would be a long time before I can skate with decent speed and technique. Things would move in their own pace and I'm in no hurry to rush it. However, every time that I talk to ARA or when he's watching me skate, I get unbelievably nervous. There are voices in my head critiquing every little things that are wrong with my skating and that I'm not learning fast enough. The truth is, ARA has been giving me very constructive feedback and I'm learning lots because of it. I know that I'm not looking for an approving pat on the head. Rather, the right thing to do is to channel this nervous energy into motivation to better myself. Trust me, I am trying. I'm really trying hard, not only to improve my skating, but also to conquer this irrational fear. I love to eat pie but I have a love/hate sentiment toward making pies. Pie dough is one of the first thing that we learnt to make in pastry school, yet it is still one of the things that I haven't been able to master. I mean, yes, of course I can make a great looking pie with juicy fruit filling and all the works. However, there are so many nuance about the pie crust itself that I just can't seem to get it right every time. Vegetable shortening is the easiest fat to work with because it is pliable at room temperature and doesn't melt by the heat of my hands. However, it just doesn't compare flavour-wise to crusts made with butter. Working with an all-butter dough is tough though (now say that really fast five times). My biggest problem is cutting the butter into the flour. The butter is usually so hard that it's difficult to to do so without overworking the dough. Once the liquid is added to the dough, I have to be very careful not to underwork or overwork the dough. I have a tendency to underwork the dough simply because I get too paranoid about overworking it. I want to see a beautiful marbling of fat in the dough...this is actually one of the most lovely things about doughs. Just staring at the pattern of fat makes me happy. The one thing that I'm consistently good at is rolling out the dough. I have a knack for rolling out exact circles even when I don't try very hard. This is about the only thing that I'm confident in the whole pie-making process. The fruit filling is also one of the easier parts. In terms of favourites, wild blueberries and apples are clear winners in my books. If you've tried one of my wild blueberry pies, I can assure you that you're probably one of my favourite people too. The baking of the pie is always a nail-biting time for me. Would the juice bubble over? Would the pie have an even golden colour? Most importantly, did I bake the bottom enough to avoid the soggy-bottom-crust syndrome???? Nobody likes soggy crust regardless of how beautiful the pie may look and how everything else seems to be perfect. So you see, pies are not as humble as you may think. In fact, it is one of the things that I find most challenging to make in my dessert kitchen. I absolutely overpacked my food supply to Montreal 24 and ended up bringing back most of my picnic basket untouched. The sweltering heat certainly did not help in terms of appetite. Pocari Sweat is now my favourite electrolyte beverage...it tastes good to me even at room temperature. I ate slice after slice of Seeduction bread and many of my own cereal bars. Both of them were filling and provided energy in a slow rate. The sausages (salt & protein) were great but the cheeses (fat) were not. I took sips of bottled Royal Milk Tea for the occasional treat. Of course, I drank lots of water. I really need to catch up on my sleep now and I'm looking forward to eat more "normal" food. Hmm, perhaps it is a good time for me to start cooking (gasp!) again. I love it when casual chit-chat leads me to an unexpected wealth of information. During one of the pack skating drills at the last TISC practice, I was waxing poetic about the air-cured sausages that I got at Wisla Delicatessen, a Polish grocery store close to my office. JB said that there are lots of great european delis in Etobicoke and he would send me his recommendations later. I was expecting a couple of store names but what greeted me in my inbox was a detail list of a dozen stores, their cultural background (German, Polish, Hungarian, Slovenian, etc. ), and JB's personal recommendation of the store specialities! I'm looking forward to visit these stores one by one and share this information with everyone. Hopefully I'll have a chance to get to this after the Montreal 24hr relay and dragonboat regatta wrap up in a couple of weeks. Thanks JB, you're the best! As I was saying yesterday, I've been on a "no-cooking required" diet in the last little while. Actually, the word diet is a little misleading. I'm not really on a diet, this is more like a way of eating that works well with my current busy schedule. Other than the occasional baking that I do to make my own energy bars, I haven't cook in a very long time. Whole grain bread with lots of grains and seeds is a staple. So are different types of cheese, yogurt, skim milk, mesclun salad greens, carrot juice, orange juice, bananas, berries, nuts, and oatmeal. However, to work in enough protein without cooking is a little trickier. My new favourites include silken tofu (tastes great chilled with some soya sauce, bonito flakes, and sesame oil), canned tuna, canned sardines, and canned beans (kidney beans, chick peas, black-eyed peas). Oh, and eggs too when I actually bother to turn on the stove. I hope that I'll snap out of this strange way of eating soon. However, with such a busy training schedule the whole summer, I'm afraid I'll keep on eating like this for the next little while.